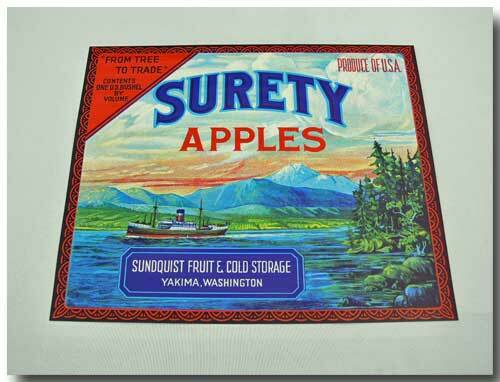 A vintage 1930’s original crate label captioned “Surety Apples” with vivid colours in blues, reds & greens with a surrounding border in red on black. Great graphic image of the west coast. This label is from original stock remaining when the companies changed to modern packing methods. They can be framed & look great in a kitchen, den or family room or affixed to the side of a vintage packing crate. Condition is great with no damage, creases or tears. Approx. size in inches: 8.5 x 10.25. Will be shipped in a plastic sleeve with a cardboard backing.